Gibby and Gadget, who is now being called Gabby, have been playing wildly for days now. Poor Gibby gets worn out long before Gabby is ready to stop, so he takes a nap while she shreds every piece of paper she can find. The noise of their wild playing gets really loud and sometimes their play includes leaping from sofa to chair to chair to dog bed and back to sofa - a wild whirlwind that makes sitting in a chair in the same room a little uncomfortable - so, I decided it was time to get some dog toys. 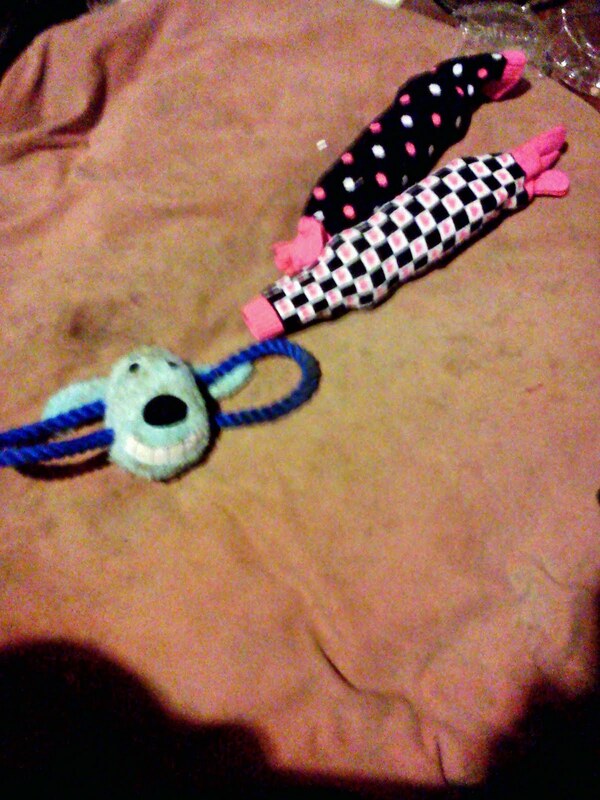 I studied a catalog, read up on "unstuffed toys" called skins, and then I added dog toys to my shopping list. When I went shopping tonight, I picked up one toy, but trying to get a lot of toys was going to be expensive - so I bought some toe socks instead. The toe socks were on sale, 3 in a package for $2. When I got home, I gave the purchased toy to Gabby and it scared her - the toy talks and does some heavy breathing just like a playful dog. After a few minutes she played with it anyway. Then I gathered up a few coke bottles - bottles that had already been stripped of their labels by Gabby - and I stuck them in the toe socks. They made great toys, the crackle and pop when chewed on, there's enough left at the cuff end to hang onto for teasing and throwing, and Gabby likes to pull on the toes - great toys. Gabby wore herself out with the new toys and is now sleeping on the back half of my chair. I got a little more hooked on my SJ today, now only three blocks to go. 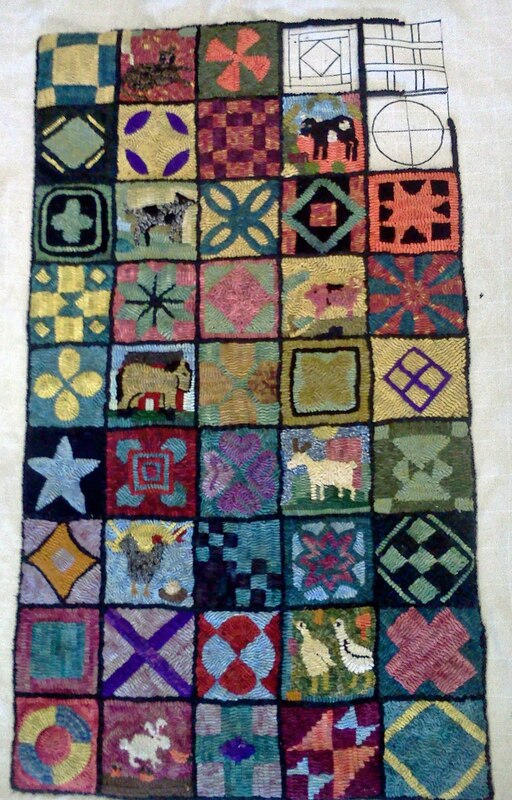 I also have a couple blocks in the middle that need to be redone - I must have been in a pretty dull mood when I hooked them. Wow Phyllis, you really accomplished a lot on your SJ rug. Now you've put the pressure on. Hey, that is cool Gibby and Gabby. Their antics sounds like a pair of reckless teenagers. They do act like reckless teenagers, Saundra - they're so bad that Patches is now hiding in the bathtub.